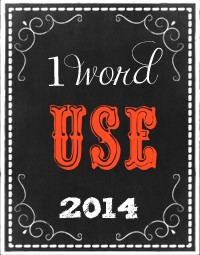 As promised, I am revealing my ONE WORD for 2014. (Thanks to Melanie from Only a Breath, who designed this cute button template to which I was able to add my word to all by myself! Also I am linking up with Random Journal Day with Dawn. 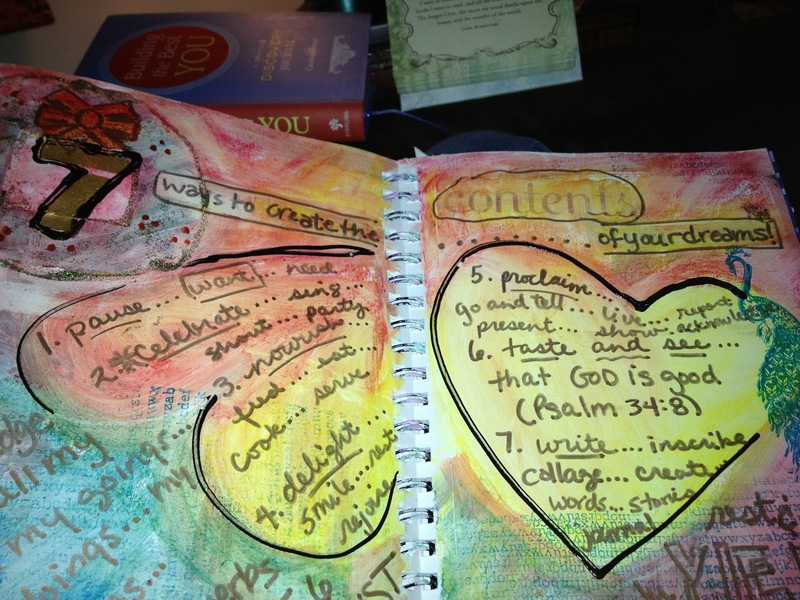 If you love to journal, join us this year on First Fridays to take a look back in our journals and journeys with God! Now that you know my word, I would love to share how it came to be MY word for this year. As I mentioned yesterday, I failed to carve out a specific time to ponder and to wonder what the new year might hold. On the first morning of the year, I was looking back over my”Holiday Re-treat” Journal, where I recorded my Advent/Christmas journey in full mixed-media color! I painted pages and filled them in when I could squeeze in the time. I distinctly remember grabbing about 10-15 minutes with the two page spread above, titled: “7 ways to create the CONTENTS of your dreams…” one evening after Christmas. I just started writing seven action words that could inspire me to keep pursuing my dreams. Dreams of teaching art classes, dreams of writing to encourage others, dreams of resting with no agenda, dreams of enjoying God’s presence and dreams of celebrating life with others. So the seven (actually eight if you count “taste” and “see” separately) words flowed onto the page: Pause, Celebrate, Nourish, Delight, Proclaim, Taste and See, Write. I looked over the list and a couple seemed right, but then the phrase: “Use what you have” popped into my mind. What if I used my ability to act on each of these activities in my list? What if I used my current wardrobe, instead of buying new clothes? What if I read the books on my shelves and listened to the music I own, instead of getting more? I think I could get USED to living this way! What ONE WORD is defining your intentions for 2014? Congratulations, Kel. It is always such a light-bulb aha moment when your word discovers you. I love living by it. I have lived a yearly theme for awhile now, before all the one-word books popped up. It’s so clarifying and enriching. Recently I read a book by Debbie Macomber on the subject and would recommend it (and btw, you can get it at the St. Louis Public Library! 🙂 ). My word is begin (or derivatives like beginning). God so clearly placed this on my heart at least six months ago, and then kept powerfully reinforcing it. May the Lord give you a use-FULL year, filled to overflowing with His purposes for you. And may you never grow used to Him in a complacent way, but may you always be awakened afresh to HIs presence and surprises. Thank you for your interest, Dawn. And have you a site? I couldn’t find it. Lynni- I am so excited for your beginnings and hoe God will bring fruit from your step of faith to begin His adventure in journaling this year! Your prayer at the end of the post for me is so needed…I’m going to copy it into my journal. I’m so glad that that blessed you, Kel. And as for the journaling….it’s really strange in a way, because in one way, I”m not beginning but just finally finishing what I had started several years back w/ the journaling. I just got stalled on the road. All that said, though, it feels like a huge leap of faith right into the ocean…or something. I’m sleepy so the metaphor isn’t good. But I do so appreciate your love, prayers, and support!!! Yes! Yes! Yes. I am so with you on your word. I call it being resourceful! I remind myself that I have so much…and decluttering happens when you use what you have and don’t get more ! ANyway, I love the library and I could share my scrappy supplies and still not run out. Let’s use what we have and share in 2014! Great word, Kel, You are such a blessing! Loving your book, by the way! Dawn! It’s you! Well, duh! You looked different in your photo. I thnk it is the long hair. But I finally found you and of course know exactly who you are. Forigve me. I just didn’t recognize you. I love your blog!!! Keep at it. You are such a delight and I love fellow journaling aficionados! Hi Lynn, not sure if you will catch this reply but I just popped back to Kel’s again and caught up with our little chain of comments! No worries. Wish I could have a group hug with you ladies! KEL! This post just jumps with excitement and enthusiasm! I can feel your special word and all the amazing ways you have already seen to USE it! Haha! Wow! This will be a fun one to follow! Thanks Susie! It has been a good word so far…every time I consider getting something new a little voice says “use what you have” nice to have a practical word but I’m sure God will surprise me with its many uses and nuances! Kel … LOVE those journal shots, a wonderful pop of color and creativity!